AKIPRESS.COM - Like many young men in Mongolia, Nanjidsurch Davaajamts grew up on a remote sheep farm dreaming of a career peculiar to a neighboring country: sumo wrestling. Professional sumo wrestling takes place only in Japan. But its top practitioners increasingly are Mongolian. Of the 58 professional tournaments that took place in Japan between January 2006 and January 2016, Mongolians won 56. 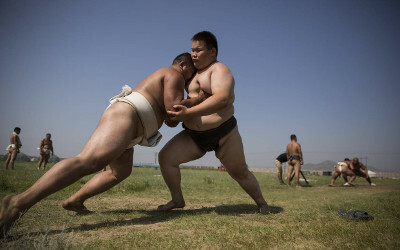 Since 2003, only Mongolians have become yokozuna, or the highest-ranked sumo wrestlers, reports The Wall Street Journal. As this year’s sumo season draws to a close, a sense of missed opportunity pervades many Japanese fans. In January, a Japanese wrestler won a top-division tournament, something no Japanese wrestler had done in 10 years. Then a second Japanese wrestler won a top tournament in September. That raised hopes of a Japanese wrestler being promoted to the rank of yokozuna for the first time in decades. For that to happen, however, a Japanese wrestler would have needed to emerge atop the year’s last competition, the Kyushu Grand Sumo Tournament, which ends Nov. 27. As it stands, three Mongolians – all yokozuna – currently hold the most matches in that tournament, and one of them will likely win the championship. The explanation is largely economic. By Japanese standards, sumo wrestling isn’t a terribly attractive career path. Sumo trainees wake at 5.30 am to begin a day of regimented discipline and training. Junior trainees aren't allowed to drive a car. They are required to wear traditional yukata – a cotton kimono – and unwieldy wooden clogs whenever they go out. In a deeply institutionalized hazing ritual that may take years, they cook, clean and obey orders barked by senior wrestlers. They don’t earn a salary. That’s a lot of sacrifice in a country with a standard of living as high as Japan’s. Even the highest-earning professional sumo wrestlers don’t earn much more than $400,000 a year. Meanwhile, the sumo retirees who have returned to Mongolia rank among the wealthiest and most successful of the nation’s 3 million citizens. They have become business moguls, real-estate developers, and members of parliament. Seemingly every boy in Mongolia knows the story of Dagvadorj Dolgorsuren, known by his sumo name, Asashoryu. In 2003, he became the first Mongolian yokozuna and launched a meteoric sumo career that both broke records and sparked controversy. Although despised in Japan for his perceived cockiness and uncouth behavior, he was given a hero’s welcome when he returned to Mongolia in 2010. After starting several businesses, he now boasts a net worth estimated to be roughly US$50 million. Today he actively recruits young Mongolian men to enter sumo, hosting the annual Asashoryu Cup, an international youth wrestling tournament held in Mongolia. Davaajamts, like many of his teenage peers, grew up watching Asashoryu on TV. It wasn’t a huge leap for them to start practicing sumo, because Mongolia has its own ancient wrestling tradition. The Mongolian wrestling techniques of deflection and throwing have contributed to nine Olympic medals in wrestling and eight in judo. This year, the Mongolian wrestling team caused a stir at the Rio Olympics when a wrestler competing for the bronze lost the medal on a technicality. His coaches were so enraged that they stripped down to their underwear on the wrestling mat, yelling at the judges in protest. Mongolia-style wrestling translates well to more-lucrative sumo. Across Mongolia’s grassy plains, or steppes, entrepreneurs have established sumo gyms and camps. Mongolia’s first sumo school opened in Ulaanbaatar in December 2015, and two Mongolian yokozuna have started annual youth sumo tournaments. Adherents dream of making a mark in the fast-growing sport of amateur sumo, which could earn them an offer to move to Japan to train for a possible professional career or earn them a scholarship to a Japanese university. Increasingly, young boys are seeing sumo as just one steppingstone into a wider world of opportunity that includes business, international relations, sumo coaching and, for the most starry-eyed, acting. There’s precedent: Byambajav Ulambayar, a 32-year-old 360-pound Mongolian, had a brief career in professional sumo, lasting only from 2001 to 2005. But he made it to the third-highest division and parlayed that success into a Hollywood career. Besides playing a sumo wrestler in Ocean’s 13, he made appearances on TV shows such as “The Bachelorette” and “America’s Got Talent”. He now lives in Los Angeles.